4th of July is just around the corner. Canon Digital Learning Center has put out an article on how to photograph fireworks. Keep experimenting and happy shooting. Below is the article in its entirety. Fireworks are one of the most inspiring and photogenic, yet challenging subjects, to capture. And unfortunately, this is one of those shooting situations where fully automatic exposure and focusing may not help. However, with these tricks up your sleeve, a few accessories and a willingness to experiment, you'll capture amazing fireworks photos this Fourth of July! Try to arrive early enough to scout out a good location to take pictures from. You don’t necessarily need to be close to where the fireworks will be launched from, but you want to be sure you’ll have a clear, unobstructed view of open sky where you expect them to explode. The closer you are to the fireworks, the more you’ll have to aim the camera upward to capture them, and the wider a lens you’ll generally need to get them into the frame without cutting part of the fireworks out of the picture. Be aware of factors like wind. 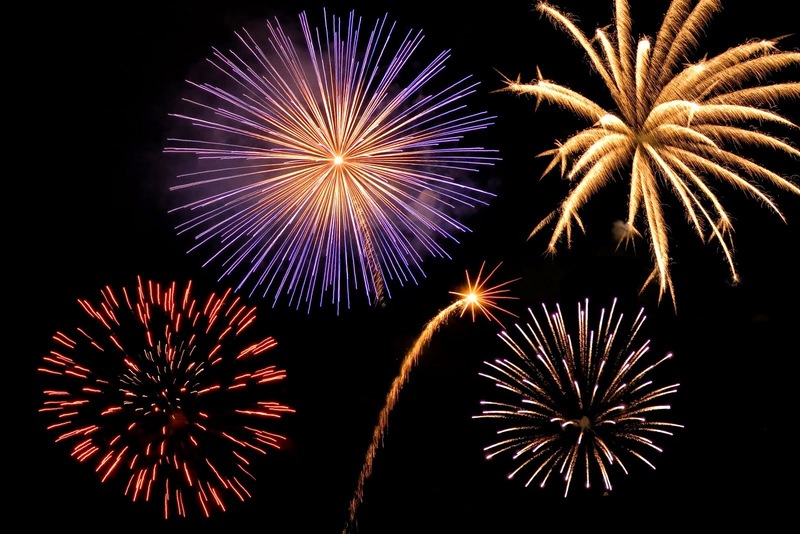 Fireworks produce smoke and if you’re downwind from where they’re launched from, you’ll be shooting through a veil of smoke that’ll interfere with your color, sharpness and exposure after the first few bursts. And of course, try to find a location where you won’t be partially blocked by other people viewing the fireworks and, likewise, where you won’t be an obstruction to others in attendance. You won’t be able to avoid crowds completely — but by arriving early, you hopefully can find a location that combines a clear view and is a bit offset from crowds of people. Bring a few things to keep you comfortable: a portable lawn chair, mosquito repellent and perhaps a lightweight long-sleeve shirt to minimize problems with biting insects on summer nights. Since you may be waiting around for a while for the show to start, don’t forget things like water. A small, clean hand towel can be helpful on hot nights to prevent sweat from getting onto the camera or your lens. And while it’s not a comfort item, a small flashlight can be invaluable for changing camera settings after dark. Turn your camera’s mode dial to “M” for Manual and manually select a shutter speed, aperture and ISO. Or, set the camera to its “Bulb” setting — more on that in a moment. Even though we speak at length about dialing-in your own specific shutter speeds, this is one instance where (usually) shutter-priority (the Tv mode) on your camera won’t be an ideal choice. Like any form of automatic exposure, the Tv mode can be fooled by broad expanses of dark sky and end up over-exposing the fireworks you’re hoping to capture. Long exposures at slow shutter speeds are the norm for photographing fireworks. Most shooters experiment with long shutter speeds anywhere from one full second to 30 seconds or longer for fireworks. These relatively long exposures will allow the burst from the fireworks to produce moving streaks, which can be stunning against a dark sky. There’s no “right” shutter speed here, so many users will try different speeds to get a feel for the sorts of fireworks pictures that result. With the camera set to Manual exposure mode, simply turn the Main Dial on top of the camera to set the speed you want to use. When manually dialing-in shutter speeds for fireworks, most users will want to see speeds with the two digital quote marks displayed after the number. Remember, the longer the shutter speed, the longer the trails of light for each fireworks burst will be in your images. At longer shutter speeds, such as 10 seconds or more, it’s sometimes possible for two or more fireworks to be captured in one single exposure. How multiple bursts of fireworks will line up in a picture is unpredictable, but it’s definitely something to experiment with. You can dial-in timed shutter speeds as long as 30 seconds with all Canon EOS cameras. But for shutter speeds longer than 30 seconds, you’ll need to switch to the BULB setting, where you can hold the shutter open for as long as the shutter button is kept in its fully depressed position. There is no “correct” aperture for fireworks shooting! In general, especially at longer shutter speeds (such as eight seconds or longer), you’ll want to stop the lens down to smaller apertures, such as f/11 or thereabouts, to ensure the fireworks aren’t over-exposed and washed-out. Smaller lens openings (higher f-numbers, such as f/16) will tend to give you thinner fireworks streaks with richer color saturation and less tendency to wash-out (especially if more than one burst of fireworks appears in the same image). If you do use shorter shutter speeds (such as 1 second), this is an instance where you should start out at wider lens apertures, such as f/4 or f/2.8. Adjust as needed after shooting and viewing the first few fireworks shots you take. Don’t pay attention to the metering scale in your viewfinder! Normally a reliable tool when setting exposure in Manual mode, this scale will read the dark sky and try to guide you into a middle-gray rendering of this dark expanse — exactly what you don’t want in fireworks pictures. Set an initial shutter speed and lens aperture in Manual mode, shoot a picture or two and look at them on your LCD monitor. Adjust shutter speed and/or lens aperture as needed but, again, fireworks are an unusual type of photographic subject, so ignore that metering scale! Be sure you know how to set lens apertures in Manual or Bulb mode with your camera. With EOS Rebel models, press the Av/± button (hold it in) and turn the top Main Dial. For other EOS models, turn the large Quick Control Dial on the back of the camera to adjust aperture when in Manual and Bulb mode. Even though you’re shooting the nighttime sky, fireworks are generally a situation where you want low ISO settings. Unless you’re trying to use shutter speeds faster than perhaps 1/8 or 1/4 of a second, we normally would suggest manually dialing-in low ISOs such as 100 or 200. Once again, we usually suggest that you bypass the Auto ISO settings in your camera. They are a potentially valuable asset in “normal” daylight shooting conditions, but fireworks represent an unusual type of lighting that doesn’t lend itself well to most types of automatic exposure control. This can be a big benefit in fireworks pictures — helping to add color and vitality to streaks of fireworks, and minimizing that washed-out look to bright highlight areas. It can be set with nearly any recent EOS camera, and works at any shutter speed. About its only limitation is that when it’s active, the lowest available ISO speed is now 200, rather than ISO 100. Regardless, this is a setting that should be strongly considered. This will similarly tend to reduce contrast, expand your dynamic range, and give you color in bright fireworks streaks that might have been rendered as a washed-out, bordering-on-white tone at factory-default settings. Fireworks pictures are rarely about increasing detail in dark sky tones — we usually want them to be dark in the finished pictures — but anything that can enhance bright highlights in your fireworks is helpful. These two features are worth trying the next time you shoot fireworks images. There’s no getting around it: a firm support (ideally, a tripod) is mandatory for satisfactory results when shooting fireworks. Even if you’re using an image stabilized lens, the likelihood that you can hand-hold that and the camera completely steadily at slow shutter speeds, like one second or longer, is pretty slim. Activating the camera’s self-timer still requires you to press the shutter, but gives either a 2-10 second delay before the shutter actually fires — giving the camera a few moments to “settle down” from any shaking after the camera was touched. The problem is that you no longer can precisely time your shots to match when a fireworks rocket is launched upward. But at longer speeds, when you expect to have the shutter open to capture multiple bursts, the self-timer may be a viable option. An electronic remote control switch (sometimes generically referred to as an “electronic cable release”) is a short cable that connects to the camera and has its own shutter button. By pressing this button, you can trigger the shutter without directly transferring shake to the camera and lens. One huge benefit of the Remote Controllers is that their shutter button can be physically locked in its fully depressed position with a sliding lock switch, allowing the camera’s shutter to remain open steadily for long Bulb exposures. Canon also makes cordless remote controllers, which fire an infrared beam to trigger the shutter on compatible EOS cameras. The compact and affordable RC-1, RC-5 and RC-6 remote controllers work with specific EOS models, allowing them to be fired up to about 15 feet from the camera. The professional-grade LC-5 remote controller is a set with a separate transmitter and receiver for cameras compatible with the “N3” type remotes listed above. The shooter can be up to about 300 feet (100m) from the camera with the LC-5. Unlike the cord-type remote controllers, the infrared cordless ones cannot hold the shutter open in Bulb mode. They can, however, be used when you manually set a shutter speed, down to 30 seconds. The EOS 6D is the first Canon EOS model to have built-in Wi-Fi capability. One option with this system is to download Canon’s free “EOS Remote” app to your phone, connect the camera and phone, then remotely fire the camera from the phone. You can even see a live view of the scene through the lens of the camera on the phone before you fire it, then see the finished image after it’s taken. The phone can be up to about 100 feet (30m) from the camera. Bulb mode can be used with EOS Remote and your mobile device, with the camera’s shutter remaining open as long as you keep the button on the phone’s LCD screen depressed (there is no separate locking switch for long bulb exposures). To check out other features the EOS 6D is capable of, check out our on-camera tutorials. With the camera pre-positioned and set to Bulb mode, watch for a fireworks shell to be launched upward. Press the shutter button to open the shutter and keep it open for the burst to occur. Wait a few moments after the initial burst to record the streaks and any secondary bursts that may occur. Then remove your finger from the button to end the Bulb exposure. Same as above, but after the first burst, keep the shutter open for another burst or two. Don’t go overboard, because as multiple bursts on one image build-up, you can easily run into over-exposure. Depending upon where each appears on the image, the beauty of individual bursts can become more of a jumble of random streaks. Two or three bursts can be effective, but don’t feel like you have to keep the shutter open for a minute or longer — you’ll likely just over-expose the scene. Leaving the camera’s shutter open for long periods in Bulb mode to capture multiple bursts can be effective when they occur in quick succession, but (especially early on in a fireworks show), some time may occur between each shell launch. If you’re looking to get multiple bursts in this situation, bring an opaque baseball cap to cover the lens in between each burst while the shutter remains open in Bulb mode. This is especially easy if you’re using an accessory electronic remote switch with a locking shutter button. Let the camera capture the first explosion, then immediately (and gently) drape the baseball hat over the lens, to cover it. Leave the shutter open, with the remote’s button still in its locked position. When the next bursts go skyward, remove the hat to expose the imaging sensor and after it’s completed, “cover” the lens with the hat again. Don’t mix too many fireworks bursts this way, but experiment with different numbers of them. When you’ve got enough for one picture, slide the locking switch to unlock the remote’s shutter button and the exposure ends. You’re ready for the next bulb-timed picture. If you don't have a baseball hat, any solid object large enough to fully cover the front of the lens should work fine (such as a piece of cardboard). Unlike many shooters who use long shutter exposures, Canon Product Educator Jim Dicecco has had great success using shorter speeds. Jim explains: “Fireworks are much easier to shoot than most people expect. However, you do need to plan ahead. Here is my usual equipment: a digital camera, a wide-angle zoom lens (my favorite focal length for shooting fireworks with a full-frame camera is about 24mm, or a 15mm lens on cameras like an EOS Rebel or 70D), a remote shutter release and a small tripod. “My camera settings are usually: ISO 100, Bulb mode (generally held open for about half a second to two seconds) and the aperture all the way open (usually around f/2.8, f/3.5 or f/4 depending on the lens). Focus is usually set to infinity but the first few fireworks can help establish focus. I prefer using cameras with Live View so I can watch while I'm shooting. When the shot is taken, it is all about timing. I look for the rockets to take off and try to time the explosion. I use the remote release so not to move the camera and hold down the button watching as the fireworks expand to the point where I want to stop the exposure. It’s all about timing the expansion of the display in the air. Post-production consists mostly of cropping since composition was difficult to control under these circumstances (one reason for the wide angle lens). Now, turn the focus ring until you’re set at infinity focus. Some Canon lenses have a distance scale printed on them for this purpose, but others (like the popular EF-S 18-55mm kit lens) do not. If you don’t have a distance scale, with the lens set to “MF” and the front of the lens facing you (as if you’re staring into the lens), turn the focus ring with your fingers clockwise until it stops. Now leave it there and do not set it back to “AF” until you’re done shooting fireworks. Any time a digital camera’s shutter is held open for longer than a few seconds, for technical reasons, it’s possible to see an increase in visible digital “noise” in the picture. This is sort of like film grain or the “snow” you might see on a TV screen with weak reception. As shutter speeds get progressively longer (10 seconds, 30 seconds, 1 minute and so on), this noise can build up and become increasingly apparent. Most Canon EOS digital SLRs have an available feature called “Long Exposure Noise Reduction,” which can be activated by either a Custom Function or menu setting. Some users wonder why this noise reduction feature isn’t always on at all times. The answer is that using it can slow down your shooting of one picture after another. To do its job, Long Exposure Noise Reduction has to re-energize your imaging sensor and take a “blank” exposure, after your actual picture is taken, for the same length of time. During this time, you cannot shoot another picture — the red card “busy light” on the back of the camera stays on until the process is completed. If you shoot a 30 second exposure, the camera has to be tied-up for an additional 30 full seconds to process before your next picture can be taken. This can be a problem during rapid repeating bursts of fireworks. As a practical matter, the noise build-up at shutter speeds of 30 seconds or shorter (10 seconds, 1 second and so on) is so minimal that you’re usually better off leaving this noise reduction off for fireworks shooting. But if you do anticipate using the “baseball hat” technique and utilizing longer bulb exposure times, you may find a noticeable quality boost if this feature is set to on. Long Exposure Noise Reduction only applies to images taken at shutter speeds of one second or longer and is ignored at shorter speeds like 1/2 second, 1/60th and so on. Finally, don’t confuse this with “High ISO Noise Reduction” on your camera’s menu. They’re two separate and independent things. Most Canon EOS digital SLRs accept an optional Battery Grip, which does allow the photographer to install one or two rechargeable batteries. With two batteries installed, any of the above figures would be doubled. Battery grips with an extra battery pack can be a great accessory for extensive shooting of fireworks displays. No matter what kind of subjects or photography we’re speaking of, great pictures begin with great composition — that is, the placement and arrangement of subjects in the image. Fireworks pictures are no different, but they present a challenge since you can’t see your final subject until it explodes in the night sky and you’re actually capturing it. You don’t always want to be among the spectators closest to the fireworks themselves. By backing off and occasionally using a telephoto lens, it’s sometimes easier to get good, sharp images of a burst of fireworks, compared to looking upward with a wider-angle lens. Look at the first burst or two to judge how much of the sky they take up, how high they go and what lens(es) will be appropriate for the types of shots you’re looking for. Remember, you can back-off with a wide-angle lens and incorporate more of the surrounding area (possibly a powerful technique near a city skyline) or you can zoom in with more of a telephoto lens to emphasize the colors from the fireworks themselves with less emphasis on the surrounding sky. Just as when you’re shooting pictures of people, consider whether to use horizontal or vertical composition. Try to look through the viewfinder during the first burst or two to judge what will most effectively fill the frame and the amount of background information you want. Also, don’t let your eyes play tricks on you when you look through your viewfinder or use the Live View feature on your camera: it’s easy to concentrate visually on the fireworks’ burst as it happens and lose sight of the fact that there may be large black areas of surrounding sky that you’re not taking into account. Always try to judge the position and size of the subject in the context of the entire picture area, from corner to corner. The Live View feature of many recent EOS models can be useful to get an idea from the first burst or two of how the frame will be filled. Try mixing things up as you shoot the show. Change lens apertures, alter the number of bursts you capture on a single frame, vary your zoom setting, shoot some pictures with foreground details and others where you’re zoomed in more on the sky. The more you shoot, the better the chances of some really exciting pictures.